Like many I’m hoping to take the new advanced VMware certification VCAP-DCA later this year. This is my first post in my VCAP-DCA study notes series and covers section 8.3, Administer vSphere with the vMA. The notes are mainly intended as a revision list rather than a tutorial so you should have some knowledge of the topic before starting (there are links at the bottom to help you get started if not). Most of this content has been covered elsewhere previously so kudos to those who spent time discovering it – I’ve simply collected it all together for reference. I’ve covered the topics on the VCAP-DCA blueprint and included some detail on the new vSphere 4.1 features as you never know when they’ll get included in the exam. The only exceptions are esxcli and vmkfstools which I’ll cover as part of section 1 (managing storage) and section 6 (troubleshooting). During install you’ll need to provide network details (DHCP or static) as per any appliance along with a password for the vi-admin account. 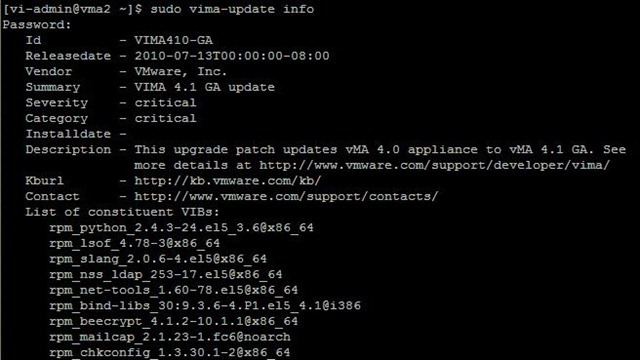 NOTE: If you’re behind a proxy you’ll need to configure the /etc/vmware/esxupdate/vimaupdate.conf file to include proxy details. This only allows you to specify an http:// proxy and port – you can’t enter credentials. NOTE: You can also update vMA from a local repository (all versions) or an offline bundle (4.1 onwards). See this VMware thread for details. NOTE: You can’t upgrade from vMA 1.0 (also known as VIMA) to vMA 4.0. You can check the installed vMA version via the appliance status screen in the VI client (only available when deployed via http (not local) OVF, not updated when using vima-update). You can also check version info via the main config file (see next section for details), or via the splash screen on the appliances console session, or by using ‘cat /etc/vma-release’. Configure the timezone and keyboard settings (timestamps are important when used as syslog) – VMware KB1007551. Use UTC (ESXi uses UTC). It’s perfectly possible to have multiple vMA appliances and for the same servers to be registered via vifp on them all. Likewise you can have multiple vMA’s all collecting logs (via vilogger) from the same hosts. VMware recommend one vMA host per 100 ESX servers when using the syslog functionality. NOTE: the vifp connections (step 1) are persistent across reboots, but step 2 will need repeating after every logout/reboot. BAD – Passwords are stored in the credential store in an obfuscated manner (XOR, NOT encrypted. This can be cracked relatively easily. Worse, they’ve available in clear text! Full details here. GOOD – The internal password used within the Fastpass system is rotated every week by default. ‘vifp recoverserver’ can be used to fix a corrupted credential store (this can occur when vifp rotatepasswords is interrupted by network issues among other causes). See Troubleshooting section. You can join vMA to a domain using domainjoin-cli. Once you’ve joined the vMA you can add hosts using the same process as Fastpass but using ‘–authpolicy ad’ parameter. NOTE: You must reboot vMA after joining the domain. If you want to execute commands against ESX hosts (either directly or via Virtual Centre using the –vihost parameter) the hosts may also need to be joined to the domain for AD passthru authentication to work (see this VMware communities thread for more). This seems to be a vague area at the moment with quite a few posters experiencing issues. NOTE: This will produce the errors shown above which can be safely ignored so long as the final SUCCESS appears. Once the vMA appliance is joined to a domain you can login to the vMA appliance using your domain credentials (domain\user) instead of vi-admin. NOTE: If you join the vMA appliance or ESX hosts to your Microsoft domain they need to be licenced according to the usual Microsoft policy. To read more about AD authentication use the links at the bottom of this post. Enable authentication for the hosts you want to collect logs from using Fastpass. With ESXi prior to 4.1 the vpxa.log files were not sent by default to a syslog server. See VMware KB1017658 for details. This command can be used to manage virtual machines, as opposed to most of the vicfg-* tools which work on hosts. Typical uses are for registering VMs to vCenter, taking/removing snapshots and forceably shutting down a failed VM. These operations can be performed more easily using PowerCLI, but it all depends on your requirements – vmware-cmd can be used during a scripted install for instance whereas PowerCLI is unavailable. The main reference document is VMware’s vSphere Command-Line Interface Installation and Reference Guide (section 8). When decommissioning a vMA appliance you should clear down the VIFP server list. This will remove the local vi-admin and vi-user accounts on the ESX/i hosts. Excellent set of study notes and a big help for me especially with the PowerShell area. Glad they’re helpful, I’ve used your notes as a starting point for collecting resources. Hopefully we’ll both be VCAP-DCA sometime soon!